Turkish police have seized four invaluable ancient books written in Syriac and Aramaic, including one depicting the life of Jesus Christ. 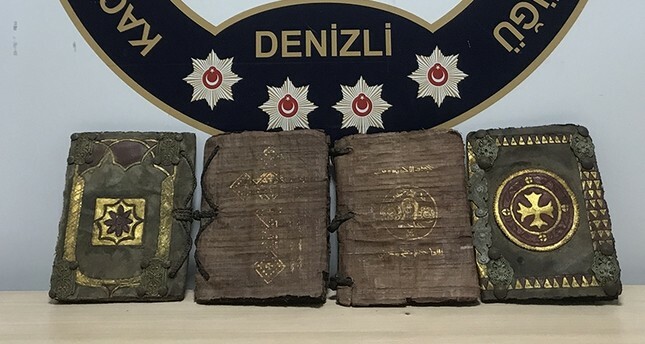 Anti-smuggling police teams carried out an operation in southwestern Denizli province upon receiving intelligence that smugglers were planning to sell the ancient books. Written on papyrus, the leather bound books are thought to be over 1,000 years old and were smuggled from the Middle East. Police detained suspects identified by initials as E.Y., A.T., E.Ş., and O.Ş., as they were trying to sell the books. In their testimony, the suspects — who were arrested and sent to jail — claimed they found the books in the garbage. Archaeology Professor Fahriye Bayram from Pamukkale University confirmed the authenticity of the books, saying that they had been requested and used by royals. She noted that the books might have been smuggled from museums in Syria, noting that there was no record inscribed on them. The professor said that some parts of the books were cut, which may mean they had been marked with inventory numbers of the museum they were stolen from. She further noted that many artifacts written in Aramaic have been stolen from Syria during the war and smuggled to various countries including Turkey. Some pages of one of the books included images depicting the life of Jesus Christ, including the period from his birth to his death. Another book focused on zodiac signs, as well as a double-headed eagle, and what happens to the soul after death. Experts noted that an extensive examination of the books would be necessary to determine the content and the exact period when they were written. Turkey shares a lengthy border with Syria and has seen a tremendous flow of refugees fleeing from a country destroyed by the civil war which is entering its sixth year in March. Turkey claims that border security and customs officers are trained to deal with cross-border smuggling operations. Customs officials, art dealers and collectors were also given an emergency list of possible artifacts that could be smuggled into the country.